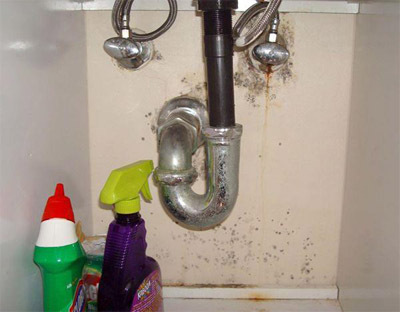 Mold is a growing issue and has been linked to many health problems. According to the Mayo Clinic, 93% of Chronic Sinus Infections have been attributed to mold. Farmers Insurance has reported an increase of 1100% in mold related claims. 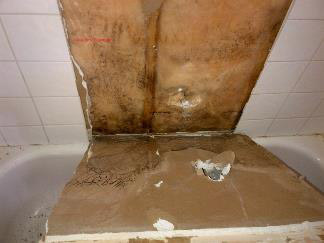 Insurance companies in Canada however do not cover mold related claims whatsoever. The American Bar Association states that there has been a 200% increase in construction defect mold litigation over the past 5 years. The average costs for a level 1 (< 10 sqft) mold remediation starts at $1,500 and can rise into the tens of thousands for level 2 and level 3 mold removal projects. The same mycotoxins (trichothecenes) that are released by the mold growing in our homes was used as a biological weapon in the Vietnam war causing over 6,300 deaths. Before moving into any home, condo or apartment, be sure to give it a thorough inspection to save yourself thousands of dollars and frustration in the future. Here's a quick checklist to make sure that you can perform a basic check to ensure a mold-free environment. If you do end up buying your house, then we would suggest getting an inspector in. If you're renting the place, then these simple checks may just be enough for you. Click here to download a summarized, PDF version of this document. 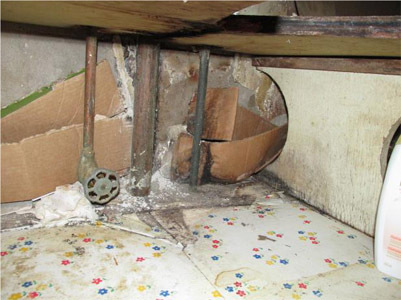 In order to fully investigate hidden mold problems, sometimes it may involve disturbing potential mold areas (eg. unpeeling a section of wallpaper). Doing so can release massive amounts of spores into the environment and cause spreading into other areas of the household. Please be respectful and do this with caution! People with severe asthma, compromised immune systems, elderly, infant, or otherwise at extra high risk of mold or other illnesses should be on higher alert as prolonged exposure to mold growth has been known to cause respiratory illnesses. When visiting a house or apartment, be prepared and bring a flashlight. 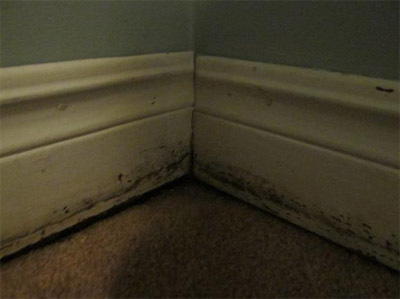 Mold doesn't require sunlight to live and grow - in fact they thrive in dark areas where it's usually more moist. A flashlight will help you examine those dark areas such as in corners, crevices and cabinets. According to industry experts, the no. 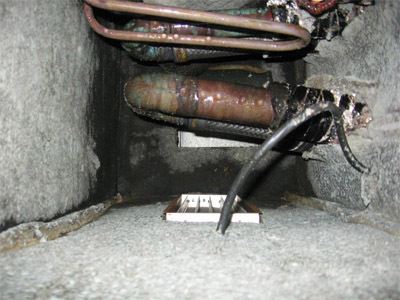 1 culprit to slip through a home inspection is a roof leak. 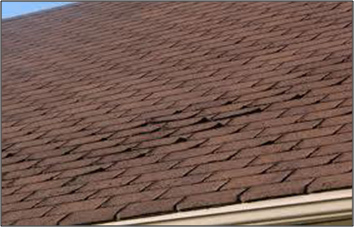 Check for missing or curling of shingles. 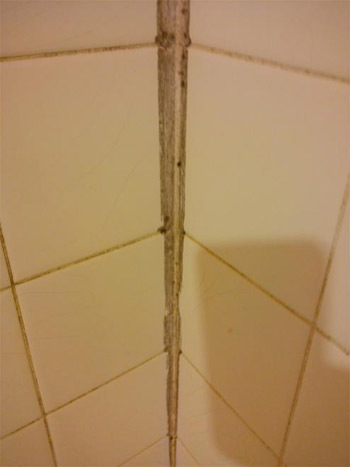 This is a sign of potential water penetration into the home. The grading should be sloping away from the house and ideally we should see 6-8 inches of concrete foundation. 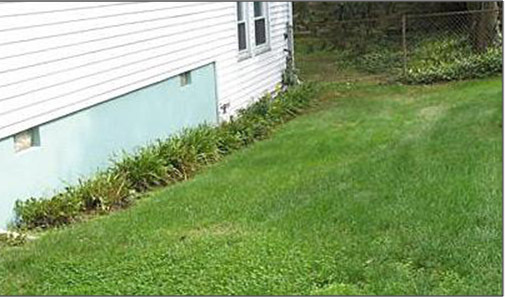 This ensures adequate drainage and prevents water from flooding into the house foundation. Additionally, all gutters and drainage spouts should be pointed away from the home using extensions. Another alternative is to have downspouts discharging directly into a drain. Look for any attempts to cover up or hide any foundation cracks. These repairs can be expensive and easily allow water into the house. 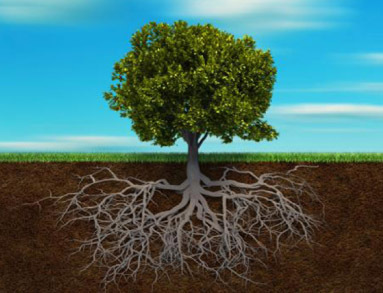 Trees around houses also have roots the same size under the earth. This increases the possibility of damaging drain pipes causing a back up of the underground sewer drain. The repairs of these damaged pipes are known to be very expensive. Do a quick inspection of the exterior siding and paint and check for any peeling, bubbling or dislodging. This could indicate water damage beneath. Any black, green or gray patches that are somewhat powdery and smudged, are usually signs of mold growth. Often times we’ll find these in moist areas of the home, but can exist anywhere. Here are things to look out for inside your potential house or apartment. Often times we’ll find patches of discoloration or stains. These areas typically include ceiling spots under the bathrooms, ceiling corners of exterior walls or under windows. Examine the image above (look carefully) – do you see the uneven texture? As you walk around the house, check the air for any traces of mold odor, especially in the basement. Mold is often times hard to spot, and mold spores are invisible to the naked eye, so the musty smell is usually a good indication of a problem. 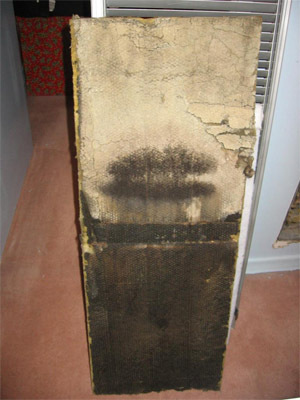 Mold has a musty, stale and damp smell to it like an earthy stale odour. 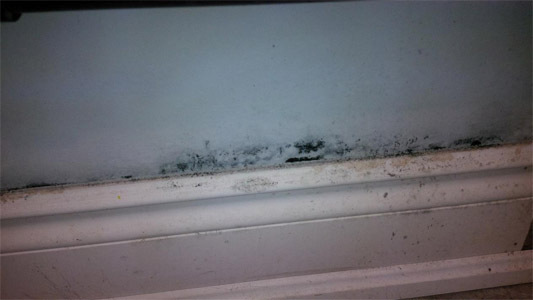 In the colder climates, we’ll often find mold growth on the windows due to a lack of ventilation. 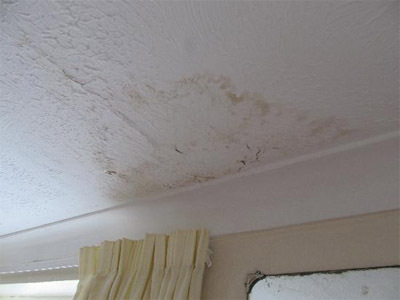 The mold here is feeding on the dust and can easily be cleaned, however the moisture from the condensation must be corrected to ensure that the mold will not grow on other materials. Open the windows and take a look below them – specifically on corners and look for wet spots or any drywall peeling. These could indicate potential problems down the line. You will want to inspect the cabinets, caulking, grout, tiles and plumbing under the sink for their condition. In addition, check that there is an exhaust fans (and it works), and whether or not the tiles and bathtubs have been properly installed. There is a lot of misinformation out there regarding mold and carpets. Unless you have a wool or a very old carpet that was made using organic materials (like jute or wool), mold does not easily decompose most new carpets. 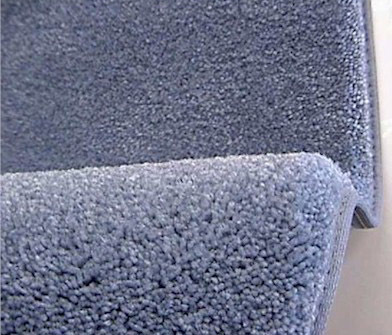 Newer carpets, such as Saxony, Berbers, Cut pile and Loop are made of nylon. Nylon itself is made of polypropylene (a plastic polymer used in many things including our new bank notes). Plastics are not decomposed by mold since they are not organic, which make them ideal carpets from a mold inspectors perspective. However, the problem arises when the carpet is stained (i.e. from water spilling). 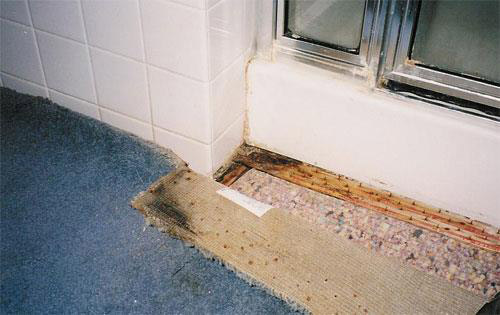 Since carpets are installed closely to baseboards and walls (both of which retain moisture for long periods of time), any water damage on the carpet can easily soak into the adjacent baseboards and drywall, leading to mold growth. To check if this problem applies to your home, inspect the corners (or if you are checking your own house, lift the carpet corners and inspect the underside and the wood used to secure the carpet to the ground – aka the tackle strip. Often times, you’ll find that the wood strips are moldy and the nails are rusty.). 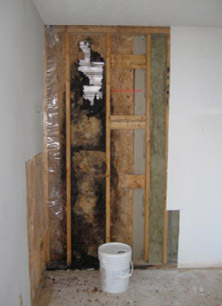 Drywall is a man-made product that contains many organic materials and is very rich in carbon – this makes it fast for decomposition by a variety of mold species, including some of the most toxic such as Stachybotrys and Chaetomium. In addition, drywall can retain a lot of moisture per volume, and in fact, the gypsum found inside can absorb water at a rate of 1 inch per 24hrs. On the underside, the rich carbon paper makes for an optimum environment for mold to growth given adequate moisture. 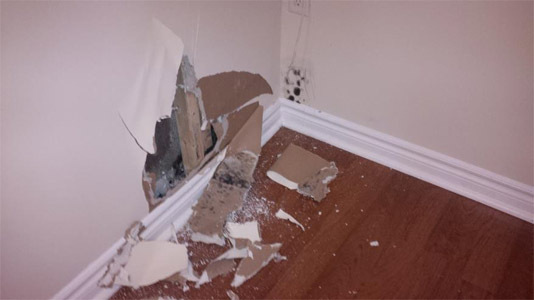 All insurance companies and water damage guides will always direct you to cut down your drywall because of these conditions that make it ideal for nurturing mold growth. In fact, 80% of mold we find every day is hidden under the drywall. With that all said, inspect the drywalls very carefully by paying attention to any discolorations, peeling and bubbling. This is especially important on the exterior walls. 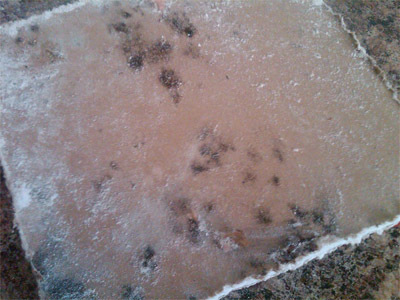 As you can see from the images, a small amount of surface mold could lead to large findings on the inside. 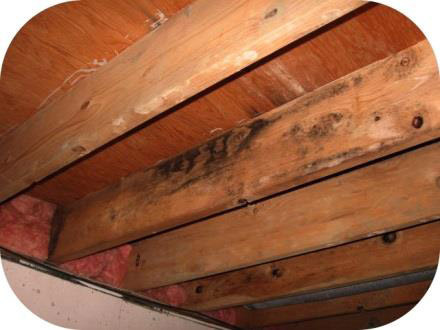 The most commonly found organic materials found in attic spaces are the wood sheets and joists. Mold will grow from excessive moisture either from a leaky roof or improper ventilation (such as fans exhausting air into attic). 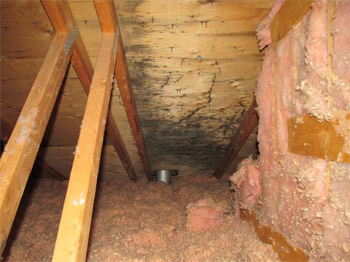 It is always smart to inspect the condition of the attic, and most home inspectors do it now. Most attic entrances can be found above closets – typically master bedrooms. Below are examples of what to look for. 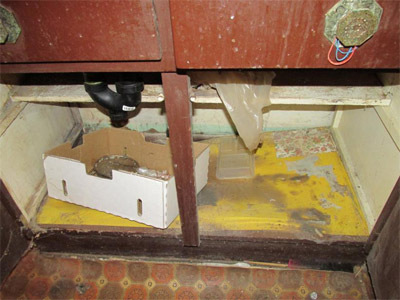 Older kitchens suffer from plumbing leaks from time to time and typically we find mold growth under cabinetry, on drywall or wood components. Occasionally we find them under vinyl flooring or under dishwashers. 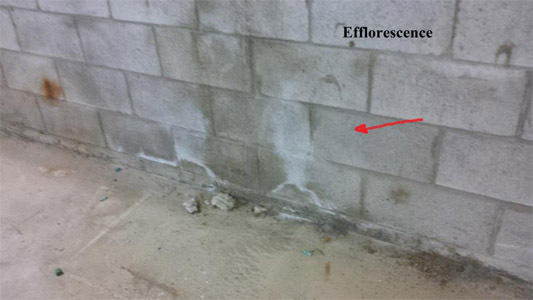 Mold does not decompose concrete, so when it’s found on concrete, it’s usually feeding on dust or on efflorescence salts caused by water damage or penetration. 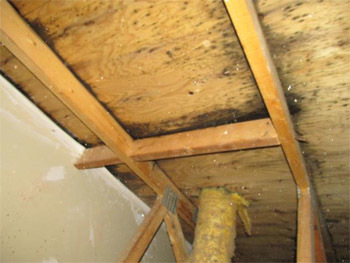 More commonly in the basement, we’ll find mold growth on the ceilings, joist and stairs. Head down to the basement and inspect these areas using a flashlight. We’ll often find small spots, rather than large patches here. Finished basements are slightly different in that we’ll find drywall, baseboards and flooring, which are all prone to mold growth. Because basements usually have higher humidity levels, it’s important that these are all thoroughly inspected. Check for any peeling, imperfections, discolorations and obvious mold growth. Due to their nature, basements are also prone to foundation cracks. 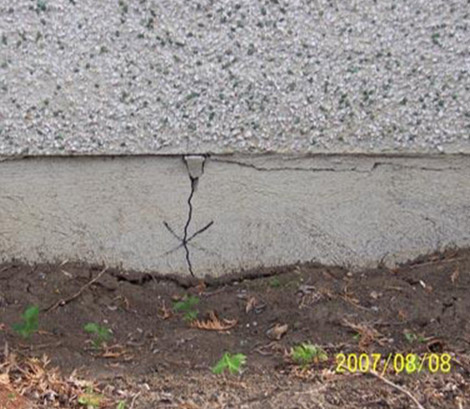 Cracks would not be visible inside of a finished basement but if you followed the steps on the exterior inspection and noticed a suspecting spot, check again on the same area on the inside. 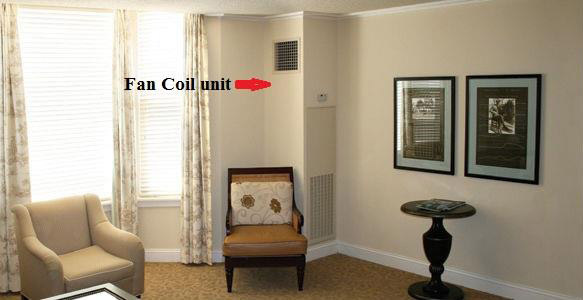 The majority of apartments have fan coil units that provide heating in the winter and cooling in the summer. Fan coil units do not bring fresh air from the outside like a furnace, instead they function on coils heated and cooled by the pipes coming from the building boiler or cooling system. 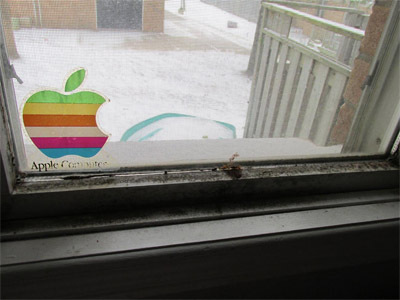 Therefore it only recirculates the air inside the unit regardless if it is clean or poor. The majority of fan coil units on buildings over 10 years old have mold on the insulation paper inside the unit. Please open it to inspect and ask who is responsible for the maintenance (you could be in for a big expense). This quick checklist allows any home buyer or renter to quickly determine the condition of your potential home. Although it does not replace a qualified inspector, it should give you a good idea of the home quality before committing to anything. A final point to make is that very few homes are perfect - so although it would be ideal if all the conditions above are met, it's not always realistic. Any imperfections however should be reflected in the house price. While Luis Anacleto or CleanFirst Restoration takes reasonable steps to ensure that the information on this guide or its websites is correct, it provides no warranty or guarantee that information is accurate, complete or up-to-date. Cleanfirst does not accept any responsibility or liability for any actions taken as a result of, or in reliance on, information on its guide.